“Chemical Component Separation” is a novel concept that involves the application botulinum neurotoxin A (BoNT-A), a potent muscle-paralyzing agent, to achieve muscle relaxation of the abdominal wall muscles as an aid in the surgical repair of complex ventral and incisional hernias and for facilitating closure of midline abdominal wall defects. However, the number of clinical studies is limited and the experience with the application of BoNT-A in the field abdominal wall surgery is still preliminary. Achievement of tension- and retraction-free conditions in complex abdominal wall reconstruction is the main objective taking advantage of BoNT-A-related paralysis of abdominal wall muscles following injections in selected points on both sides of the abdomen. Better postoperative pain control and reduction of opioid analgesia are related to the antinociceptive effects of BoNT-A. Recommended techniques to guide botulinum toxin injection include electromyography, electric nerve stimulation, ultrasound, and anatomical localization. Formulations are not interchangeable. Potential applications of BoNT-A in adult patients may include complex and non-complex midline incisional hernias with loss of domain, open abdomen, or reconstructions when the abdominal wall is intact, with or without preoperative progressive pneumoperitoneum. 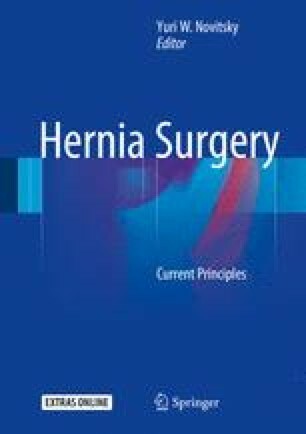 Further studies, preferably randomized-controlled designs are necessary to clarify a number of relevant clinical questions, including patient’s eligibility, dosing of the different botulinum A formulations, optimal administration technique, or benefits of potential association with other procedures. The evidence available at the present time is still weak and a clear role of BoNT-A in abdominal wall surgery remains to be defined. The online version of this chapter (doi: 10.1007/978-3-319-27470-6_41) contains supplementary material, which is available to authorized users. The authors thank Marta Pulido, MD, for editing the manuscript and editorial assistance.